Dorset is home to some of the most beautiful coastline on the south coast of the UK. 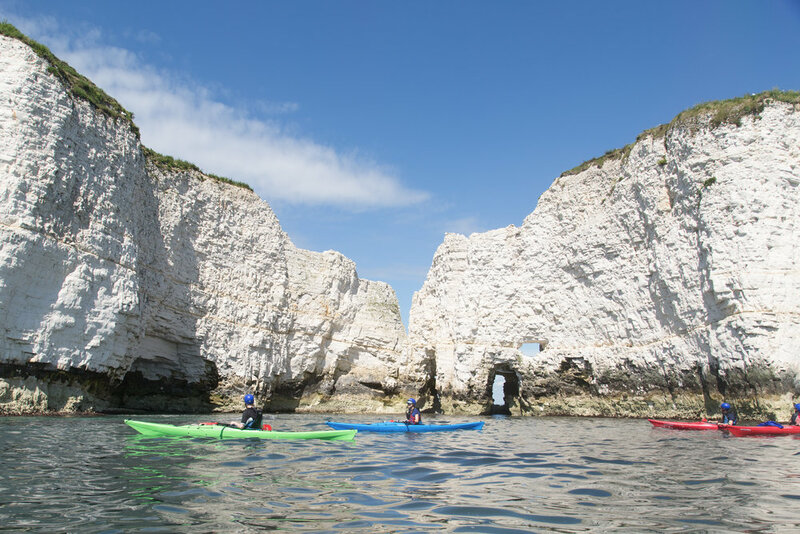 With long sandy beaches in Swanage, Studland, Weymouth and some amazing geological formations such as Durdle Door and Old Harry Rocks there is much to see by sea kayak. They don’t call it the Jurassic Coast for nothing, this area is steeped with natural beauty and was deemed a UNESCO World Heritage Site back in 2001. Most of this coastline can be viewed by foot but in order to gain access to some of its most rewarding sites one has to head out into the water. 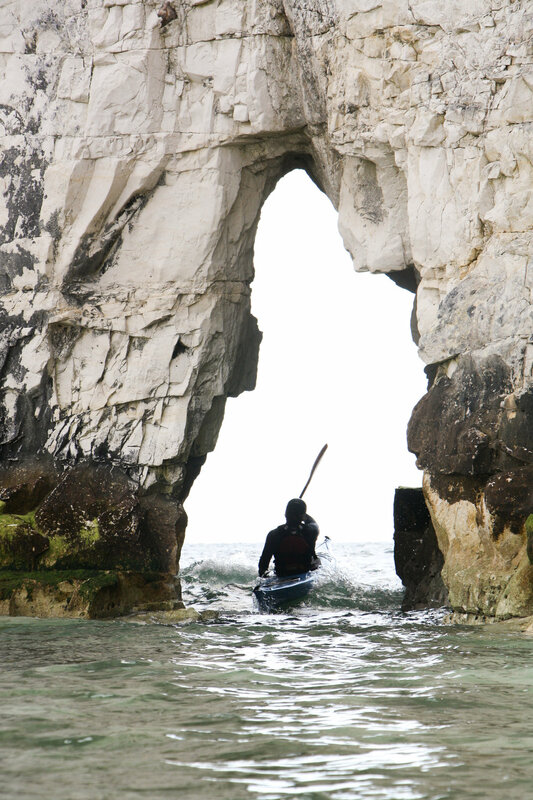 There are many ways of exploring the Jurassic Coast via the water but none can get you as close to the cliffs, sea stacks, sea arches and caves as sea kayaking and canoeing. This is probably why these paddle sports are the largest growing watersports across the UK and Ireland. Due to an increase of people taking to the sea to explore Dorsets geological history and natural landmarks there has also been a notable increase in the amount of sea kayakers and canoeists involved in rescue incidents over the last few years. Although these watersports may be the most suitable means of getting up close and personal to Dorsets coastal areas of natural beauty and local marine life, the sea can be a force to be reckoned with. It is always recommended to plan and prepare prior to getting on the water. A few simple preparations before heading off can ensure that your experience on the water is one that is most enjoyable while also ensuring your safety in the case of anything going wrong. Below our some helpful tips and hints to help you have a safe and enjoyable experience while sea kayaking in Dorset. Always wear a personal floatation device. Buoyancy aids are an essential part of your equipment, and will benefit you greatly should you fall into the water. Make sure they are correctly fitted and all straps are firmly tightened so that the floatation device doesn’t come off when entering the water. Keep them on when out on the water, the sun may be out and the last thing you want is a strange looking tan line, but whats more important, your tan or your well being? Helmets are also a good idea if you are kayaking close to the coast. Sea Kayaks create a wonderfully accessible way to explore sea caves and work through sea arches, along sea stacks and cliffs. Remember these are features of coastal erosion and are continuing to erode, always expect the unexpected. Also if in areas where the coast is accessible by foot, think about who might be on top of those cliffs and if they can see you or not. You never know what might come down be it stones that are thrown, somebodies ray bans or a selfie stick holding someones prized iPhone. Think about your paddle, its what moves you from A to B. Is it suitable for the task ahead? What happens if I drop it or worse it breaks? A pair of splits (paddles that assemble from two or three pieces) are always good to have. They can be easily assembled on the water and compact for easy storage. You can find a decent pair online or in your local watersports store and they are pretty affordable. Whether its a mobile phone in waterproof case, a VHF marine radio or a Personal Locator Beacon (PLB) always carry a means of calling for help. Make sure that means of calling for help is reachable and not tucked away in a hatch or dry bag. It is best practice to keep communication devices on you. If you are separated from your craft and your device is onboard and cannot be reached it is useless. Whether its a family member, a friend or the coastguards its always good to let someone know what you are doing. Make a plan of your trip and then inform someone what your doing, where your going, how many are going and when you plan to be back. It is also good to give them an idea of your route and the timing between each point. This allows services to narrow down their search area in the case of them being called. Once your trip is over and you’ve had the most amazing experience don’t forget to let whoever it is know that your back on dry land safe and sound, before someone is called to come looking for you. This is something that is really important when kayaking on areas of open ocean. Check the forecast the day before and prior to getting on the water. Conditions can change dramatically on the water but a basic awareness of the forecast can make your trip more enjoyable. The wind can affect most crafts on the water quite dramatically and can either blow you onto the shore or out to sea depending on where its coming from. Having a basic awareness of the wind might allow to use the coast to your advantage (tuck in under the cliffs or take a break in a cove). A solid understanding of the tides in the area you wish to paddle is also important. Numerous parts of the Dorset coastline are affected by tidal races which can be very challenging if you come across them during certain hours of the tide. Regular weather forecasting and use of tidal charts will help you to build a greater understanding of the areas you like to kayak in and will help you feel more confident each time you head out. Ensuring you are warm and comfortable while sea kayaking allows you to enjoy the experience. It may be a warm summers day on the Dorset coast and you may be enticed to make the most of the sunshine, but make sure you are prepared for the conditions to change. Its alway a good idea to bring some spare clothing with you, a thermal hat and jumper can be greatly appreciated when you’re an hour into your trip and the sun sneaks into the clouds. Although it may be a hot day it can be a lot cooler in the water and even the odd splash from your paddle can give you the chills. Dry suits are great investments if you want to keep kayaking year round. A windproof jacket like a cagoule is always handy to have. Have a dry bag on board with some essential clothing to keep you warm, you don’t have to wear everything, but you’ll be happy to have it with you should the conditions change. If you follow these basic safety tips it will give you the confidence to head out and explore the Dorset Coast by sea kayak and find some of the many hidden treasures that are dotted along this wonderful part of the country. However, if you are still uncertain about your ability to head out in your local area, get some training with a guide or join your local canoe or kayak club. These companies are bringing people out on a regular basis and will be more than happy to help you gain the confidence and training while also enabling you to meet like minded people who are also looking to explore the dramatic coast of Dorset. We run regular trips and courses on both sit on top and sit in kayaks in Dorset and can cater for all abililies, if you are new to the sport we can get you started on your journey into kayaking or if you want to brush up on your skills join one of our sea kayaking tuition courses in Dorset to help develop your kayaking skills. See our kayaking tuition page for more information and prices. Contact us directly for 1-2-1 bespoke tuition or for private groups prices.